Exploring Paris on a boat can be the most fulfilling experience for tourists. Some of you might feel that this is the most common thing for tourists and for people who take a romantic view on life. However, if you try this, your point of view will surely change and you will know that romance is a beautiful part of life and that this trip will definitely make you delve deep inside you to connect with your romantic side. The night tours are wonderful because Paris provides a different view at night. The best budget cruise for travelers traveling on a limited budget is the Batobus cruise. Batobus literally means the water bus. There will be 8 spots included in this tour including the Louvre, Musee d’Orsay, Eiffel Tower, Notre Dame Cathedral. This trip is not exactly a tourist trip. The local people take the water bus to travel inside the city as an alternative to the Paris Metro. Pass for a single day is 14 euros and for a week is 21 euros. You can check the schedules on their website and the frequency reduces during winter months. The yachts of Paris offer the most romantic of cruises over the Seine River. Take the cruise on The Don Juan II and feel the romance in the air. This is a luxury cruise where you can have dinner on the European yacht. Don Juan is almost like a floating mansion which offers various facilities like leather armchairs, library, tableware, designer linens and mahogany bar. The dining menu is a 6 course one prepared by a famous chef while admiring the city of lights. Since this cruise is meant for couples going for a romantic tour the price is quite high at 198 euros. The Bateaux Parisians cruise is a night tour which combines dance and dinner. Enjoy the wine, champagne and the gourmet dinner served to you while listening to the cool music played by a French Band. After dinner you can join the dance floor for sizzling moves. You have a choice between a festive cruise and a romantic cruise on the Seine. You can either dine outside under the sky or inside by paying 188 euros per person or 70 euros. Bateaux Mouches in the cruise meant for fashionistas visiting Paris. If you love fashion and have a dress which can be worn during a cruise party at night, then cruising along the Seine on a Bateaux cruise is perfect for you. The name meaning “fly boat” harbors modern restaurants and glass-topped facilities for sightseeing. 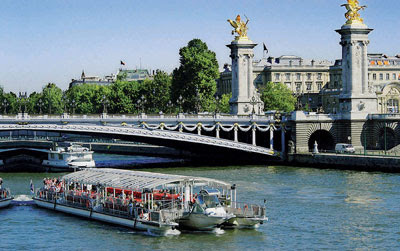 In fact, this is the first boat to provide the Parisians to see Paris sailing over the Seine River. The seating arrangement inside faces a glass wall through which the beauty of Paris is visible. This entry was posted in things to do in Paris and tagged Bateaux Mouches, Bateaux Parisians cruise, Batobus cruise, budget cruise, Notre Dame Cathedral, Paris on a boat, Seine River, Seine River Cruise, yachts of Paris. Bookmark the permalink.